Compare prices from several car hire companies in Marbella and find the best price for car rental. Our prices always include unlimited mileage and insurance. 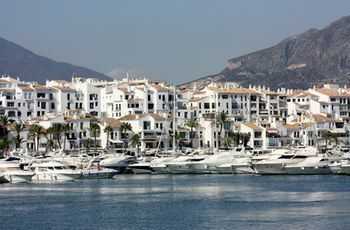 Marbella is beautifully situated on the famous coastline, the Costa del Sol, the very south of Spain. There are about 60 km to the coastal town of Malaga in the northeast, and the population of Marbella is measured to be almost 135,000 (2010). Marbella is one of the most popular seaside resorts on the Costa del Sol, also for the more affluent, so the city is known to be a luxury destination. The area around the town is famous for its golf courses and in the center you can visit the fashionable shops and vibrant nightlife. On the square in La Plaza de los Naranjos is including a city hall from the 1500s. Malaga Airport is approx. 50 km northeast of Marbella and is also known as Pablo Ruiz Picasso Airport. This is the fourth largest airport in Spain.